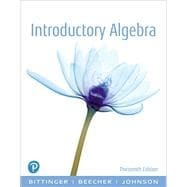 by Bittinger, Marvin L.; Beecher, Judith A.; Johnson, Barbara L.
For courses in Beginning Algebra. Trusted author content. Thoughtful innovation. Math hasn’t changed, but students — and the way they learn — have. In this revision of the Bittinger Worktext Series, the Bittinger author team brings their extensive experience to developmental math courses, paired with thoughtful integration of technology and content. The Bittinger Series enables students to get the most out of their course through their updated learning path, and new engaging exercises to support various types of student learning. Bittinger offers respected content written by author-educators, tightly integrated with MyLab™ Math — the #1 choice in digital learning. Bringing the authors’ voices and their approach into the MyLab course gives students the motivation, engagement, and skill sets they need to master algebra. MyLab™ is the teaching and learning platform that empowers instructors to reach every student. By combining trusted author content with digital tools and a flexible platform, MyLab personalizes the learning experience and improves results for each student. Marvin Bittinger has been teaching math at the university level for more than thirty-eight years. Since 1968, he has been employed at Indiana University–Purdue University Indianapolis, and is now professor emeritus of mathematics education. Professor Bittinger has authored over 190 publications on topics ranging from basic mathematics to algebra and trigonometry to applied calculus. He received his BA in mathematics from Manchester College and his PhD in mathematics education from Purdue University. Special honors include Distinguished Visiting Professor at the United States Air Force Academy and his election to the Manchester College Board of Trustees from 1992 to 1999. Professor Bittinger has also had the privilege of speaking at many mathematics conventions, most recently giving a lecture entitled "Baseball and Mathematics." His hobbies include hiking in Utah, baseball, golf, and bowling. In addition, he also has an interest in philosophy and theology, in particular, apologetics. Professor Bittinger currently lives in Carmel, Indiana with his wife Elaine. He has two grown and married sons, Lowell and Chris, and four granddaughters. Barbara Johnson has a BS in mathematics from Bob Jones University and a MS in mathematics from Clemson University, and she is currently pursuing a PhD in Educational Studies at Ball State University. She has taught high school and college math for 30 years, and she enjoys the challenge of helping each student grow in appreciation for and understanding of mathematics. As a Purdue Master Gardener, she also enjoys helping others learn gardening skills. Believing that the best teacher is always learning, she is also a student of karate.